When it comes to selling your home, one has some tough choices to make. It can be complicated and stressful, certainly not as easy as it seems. Choice No 1: Choosing to sell privately. The main advantage for this option is that you will save the Agent's commission. Unfortunately, saving this fee can often cost a private Seller dearly! Showing your own home to prospective Buyers is probably the most difficult thing to do as you are more than likely still emotionally attached to the property. Remarks from Buyers about layout, furniture and décor are often taken too personally and can upset the proverbial 'apple cart', especially when it comes to negotiating purchase price and terms of the sale. Sellers are often unaware of fluctuations in the market place and are set on achieving their price, whilst Buyers are comparing apples with apples having seen many other houses with similar features in the surrounding areas. They will look for the property that offers the best value and most suitable features. Real market value is what a willing and able Buyer will pay for a property at a given time, and not what an online valuation system predicts it to be, or how much a Seller spent on extras to personalise his home to suit his needs. 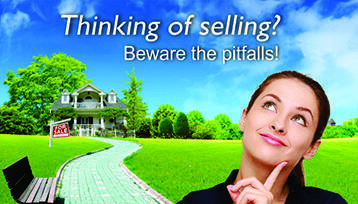 In today's market Sellers must take cognisance of the danger of losing valuable time whilst trying to figure out what, where and how to advertise and market their property. "Free" advertising often comes at a high cost in the end. Choice No 2: Choosing to make use of an Agent. The key to success in this option is to select a trained, experienced Property Professional from a reputable, registered estate agency. To establish this is no longer a difficult task as the information is readily available on the Estate Agency Affairs Board's website and all Agents' signatures should display their status by clicking on the PrivySeal icon. Property Professionals are trained to be skilled negotiators focussed on getting the Seller the best price in the shortest possible time. They know current market conditions are and what similar properties are available to the Buyer and are able to advise on marketing price, marketing strategy and realistic selling price. Regular feedback to the Seller could also assist the Seller to adjust his marketing price timeously. An Agent specialising in a particular area will most likely already have Buyers looking to buy, dramatically speeding up the marketing process. Property Professionals have tried and tested methods of marketing properties, where advertising on the property portals is but one of many options. The Agents knowledge of best photo sizes to use, in which order to arrange the photographs, the use of professional photographers and virtual tours are tools a Seller is usually not familiar with. Very often Sellers are unaware of the work that Property Professionals perform behind the scenes. Vetting prospective Buyers for security purposes before taking a stranger into your home is such an important function, whereas an over-eager private Seller may put the safety of his family at risk by not asking the Buyer the correct qualifying questions. The Agent will assist the Buyer to get pre-approved for a bond and once the Offer has been accepted, will ensure that the Buyer complies with the bond application process and stipulated terms of the agreement. Sellers need advice on their legal obligations and the costs to sell a property. The Agents needs to be aware of the broader implications of the sale. The qualified Property Professional is there to advise and assist the Seller throughout a process, one that often comes with complications and challenges. A knowledgeable, qualified, hardworking Agent is worth his every cent of the commission he earns.